Prior to my extensive jam making this Summer, I researched all sorts of methods, types of pectin, etc. 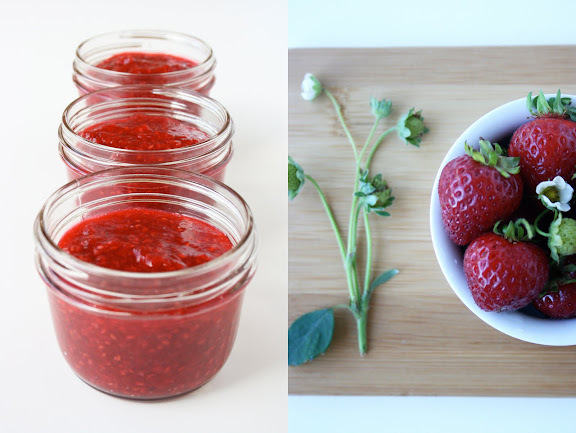 Today over at Zupas I am sharing a few things I learned about making a fabulous batch of freezer jam. I invite all novices and seasoned jam makers to weigh in! Find my freezer jam tips here. Do you have a specific freezer jam recipe you'd recommend? Thanks for the tips! I will try this pectin. I used the usual from the store and have had mixed sucess. One I don't like that it requires so much sugar and two sometimes it sets up and others as soon as the jam starts to thaw it is watery. I know freezer jam is looser than normal jam in the set up process, but it shouldn't be liquid. I hope this product works. mmm, it is perfect for me, i am a beginner! thnaks for sharing. Jojo, I use the recipe on the inside of the Pomona's pectin. You get to decide on the amount of sugar--3/4 cup to 2 cups per 4 cups crushed berries. It's really a matter of preference! I usually hovered around 1 cup of sugar to 4 cups of berries. Good luck! I'd love to hear your thoughts after using it if you can get your hands on some. My girlfriends and I are jamming it up in just a few weeks! There's an orchard full of end-of-season peaches down in Santa Cruz just calling our names. thank you so much for posting this! i have been wanting to try forever, am inspired!